Happy Monday! 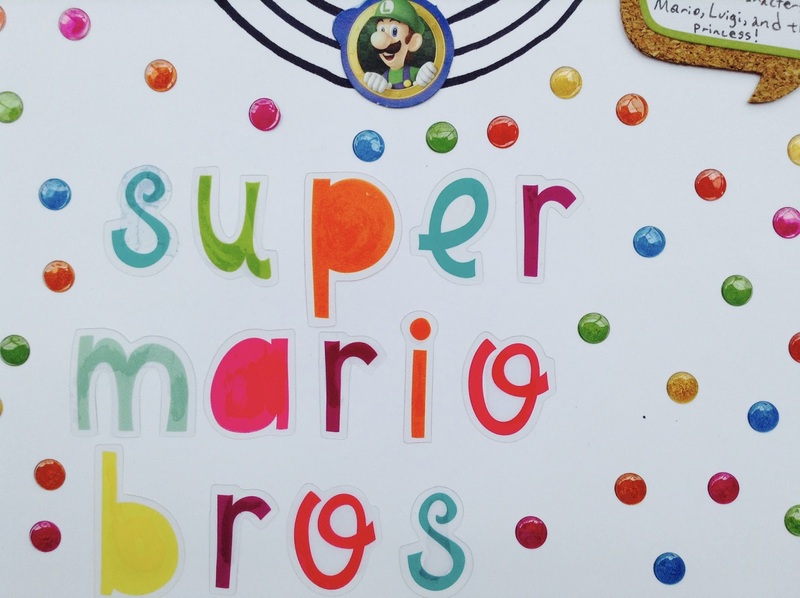 I'm over at the Nerd Nest where I talk about documenting the things my boys' say when they play Super Mario Bros. Happy Sunday! 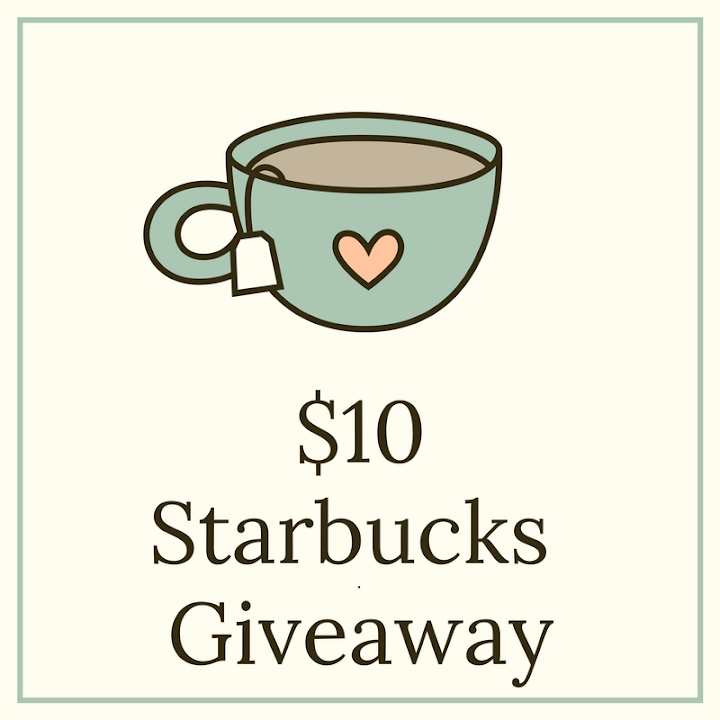 Today, I'm joining Krysten and Lindsay's weekly link up. 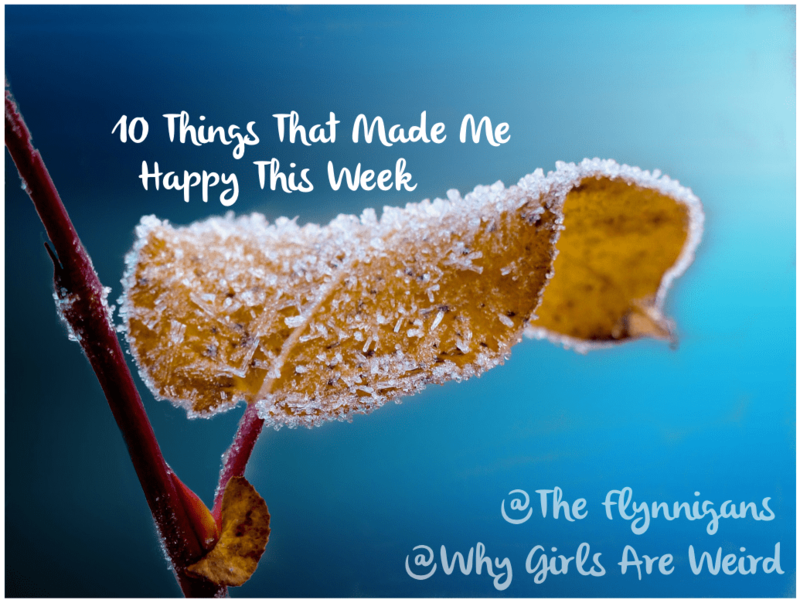 I think this link up is such an awesome idea and it's awesome to reflect on the week. 1. 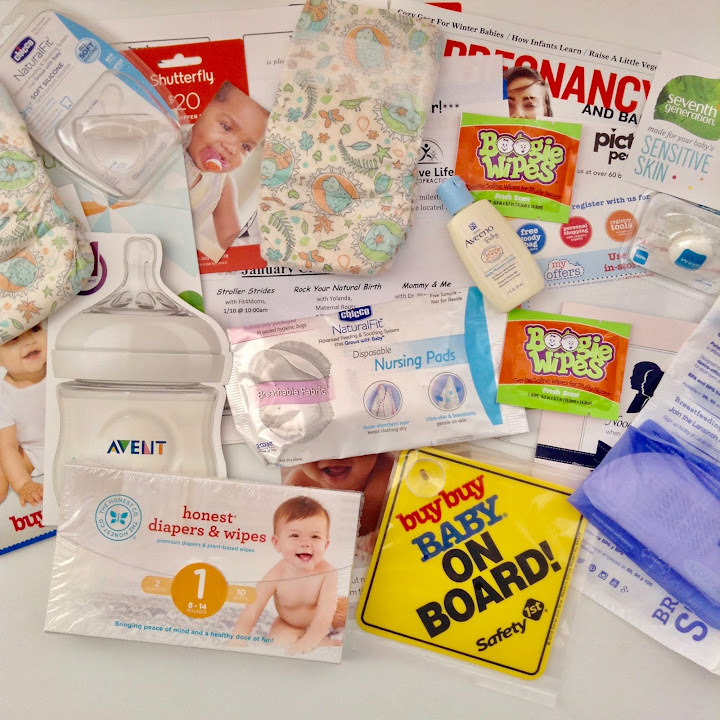 Ali Edwards' Day in the Life kit finally arrived! Hello! 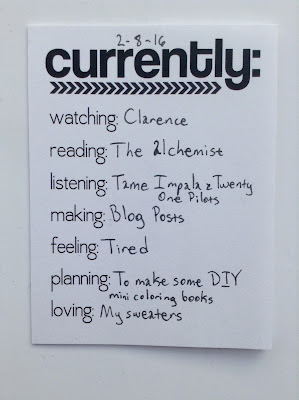 A few weeks ago, I made a Project Life card using a few supplies and mentioned in the blog post that I would be making a few more. You can check out that blog post here. Today, I want to share another card that I made. 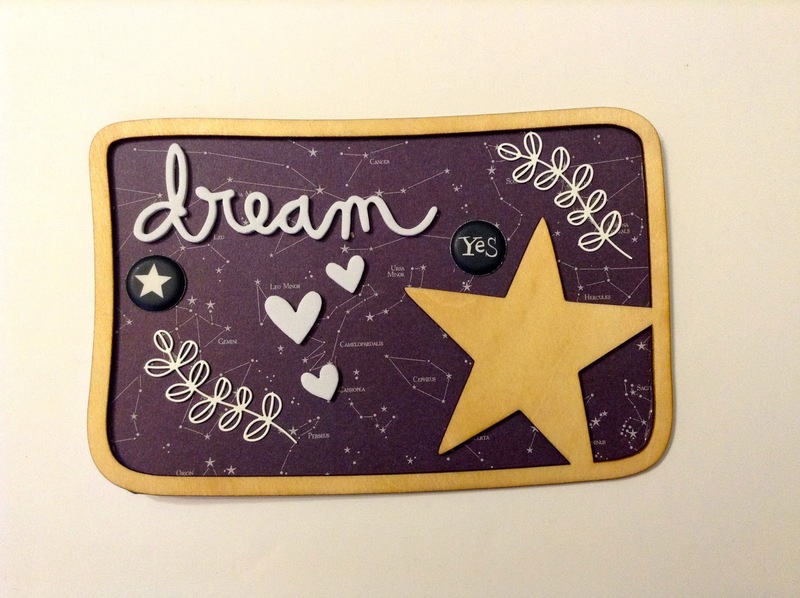 I used most of the same supplies that was used to make my "Dream" project life card, but I did add a few different pieces. I used my Tombow Xtreme Adhesive to adhere the paper to the wood veneer piece. Then I started adding the embellishments. 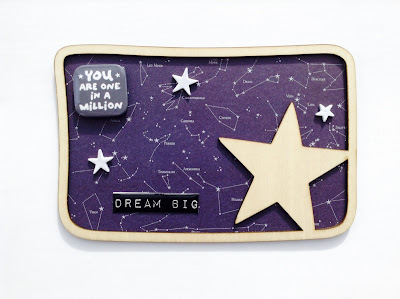 I really love the "You Are One in A Million" flair and the "Dream Big" epoxy label. I had those DCWV Inc. epoxy labels for a while and when I tried to take the labels off the sheet, the adhesive on some of the labels were no longer sticky or the paper on the back kept ripping. 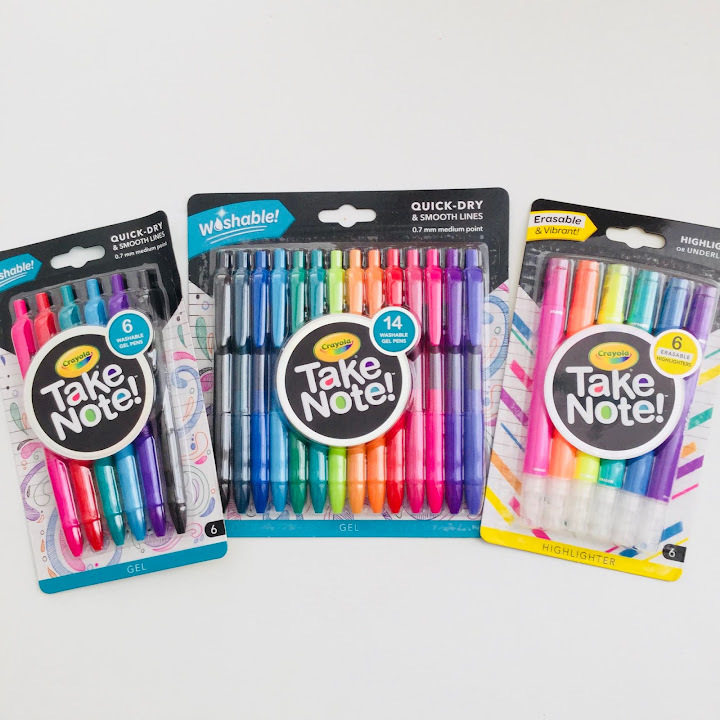 At first, I thought that I would have to toss the labels, but I was able to make them work by using my Tombow adhesive. So if you come across some stickers or labels that are either not sticking or the paper is tearing try using some adhesive like a glue runner. Loving: I just got my Day in the Life kit from Ali Edwards and I love it! My favorite part of the kit is the stamp. It's awesome and I have been looking for a stamp just like the one in the kit. 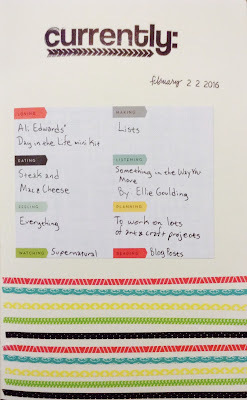 Making: I've been making lots of lists. Grocery lists, to do lists, etc....the lists seriously never end. Eating: The hubby made mac and cheese, mashed potatoes, and steaks for dinner. It was delicious! Listening: Ellie Goulding is seriously awesome! I'm really loving this song. Feeling: I've been excited, but stressed. Doesn't it sound crazy to be excited and stressed at the same time? Planning: I have a lot of art and craft projects to work on. I'm hoping to catch up on a lot of these projects tomorrow or at least get a head start on them. Watching: I watched a few episodes of Supernatural. It's cool to watch episodes from previous seasons just to see how much stuff has changed. 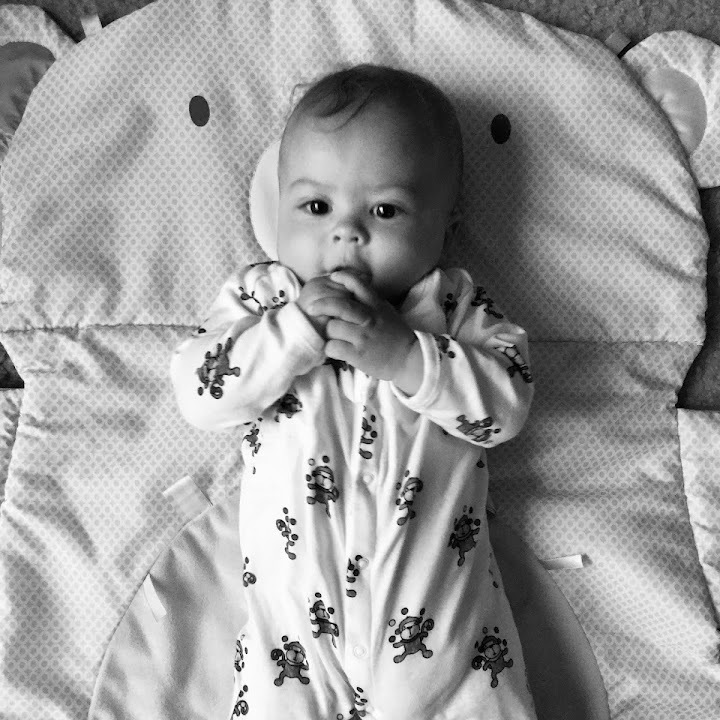 Reading: I finally got caught up on reading some blog posts. I'm also still reading The Alchemist and I may have said this before, but I can see why so many people love this book. Hello! Hello! I am so excited to share my book review! I got Super Foods Every Day by Sue Quinn from Blogging For Books. I was drawn to this book for a couple of reasons. The first reason are the colors...the cover is so bright and immediately caught my attention. The second reason is that it is basically a cookbook that focuses on super foods. I'm not into dieting, but I have been wanting to make some healthier food choices and was on the hunt for a decent cookbook. This book includes information on what super foods are, a super foods glossary, and information on vitamins. There are lots of recipes for breakfasts, salads, soups, side dishes, baked goods, and sweets. I love that this recipe included smoothies and treats. Seriously it included cakes, cupcakes, and brownies. Each recipe includes detailed information on how to cook the recipes as well as detailed information on the ingredients that are needed. My favorite recipes are the Choco Smoothie and Berry Blast Smoothie. I can't wait to try the sticky energy bars. I am so glad that I chose this book and I highly recommend this book. Have you read Super Foods Every Day? If so, what are your thoughts on the book? Hello! Hello! 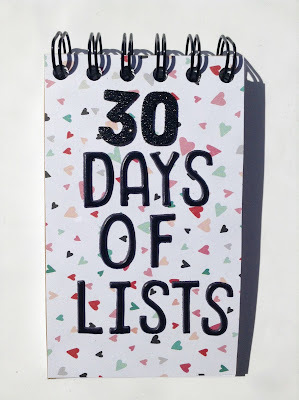 A few days ago, I registered to participate in 30 Days of Lists. As you may know, I have participated and have sponsored this challenge. 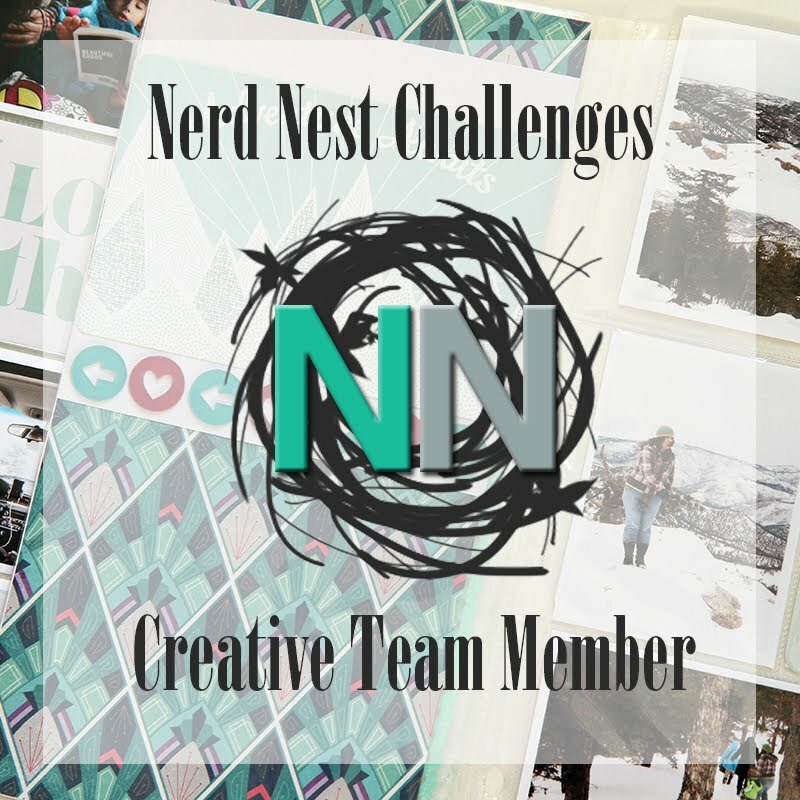 I am not sponsoring this time around, but I really do love this challenge. I decided to make a mini album for this challenge. After not using my Cinch for a long time, I decided to get it out and put it to good use. 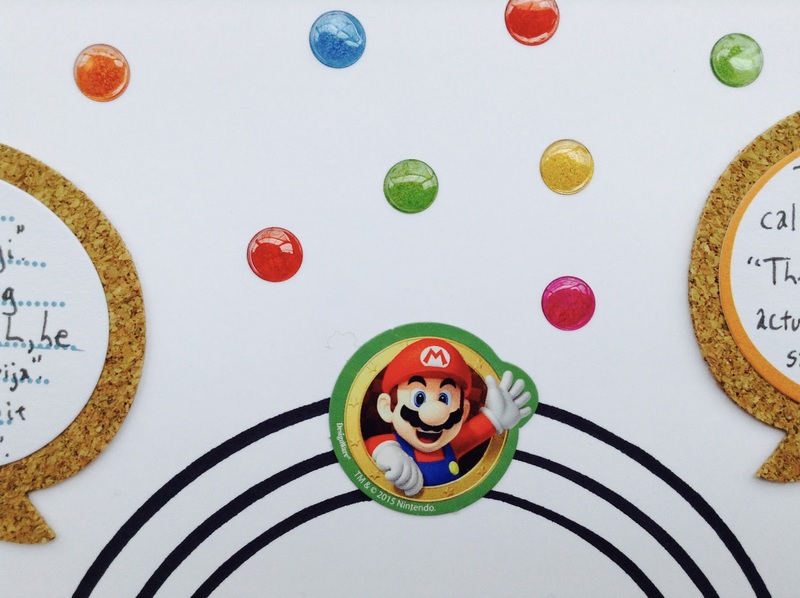 To make my album, I cut some chipboard paper that I found at Michaels. 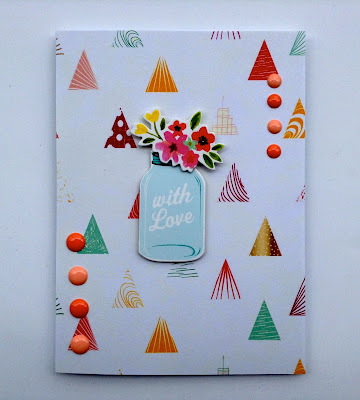 Then I adhered some patterned paper from Crate Paper's Hello Love paper pad onto the chipboard paper. Then I followed the instructions to make the album. Thank goodness that the instructions are on the actual binding machine. Once my mini album was assembled, I went through my stash and used some puffy alphas to spell out of "Days of Lists". Since the Freckled Fawn puffy alpha set did not come with numbers and I didn't have any numbers in a similar font, I decided to use some black glitter numbers. Overall, I like the way my mini notebook turned out. 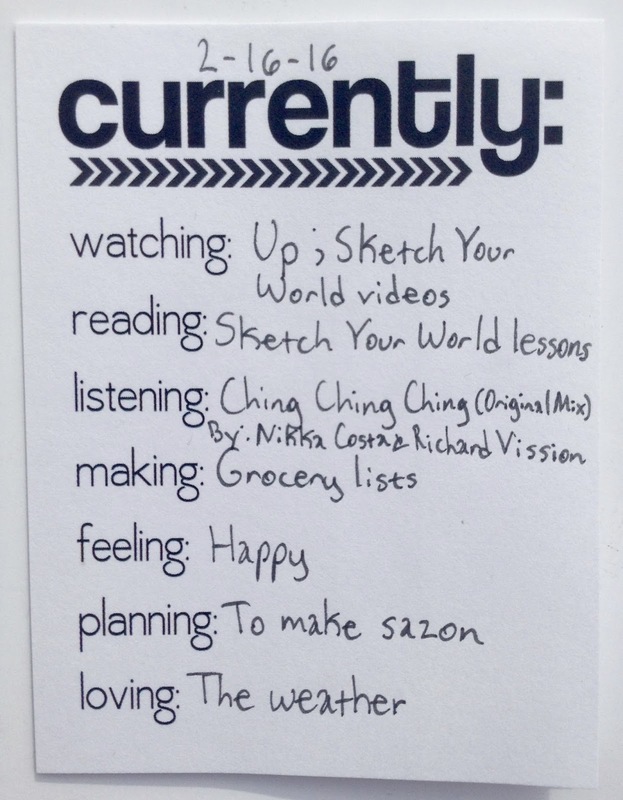 I plan to share a few of the pages in my notebook next week so be sure to be on lookout for that. Are you going to participate in 30 Days of Lists? Watching: Up is definitely one of the best Disney movies ever! I have no idea why it took me so long to watch it, but I'm glad that I finally did. My boys love this movie and have watched a couple of times over the past few days. 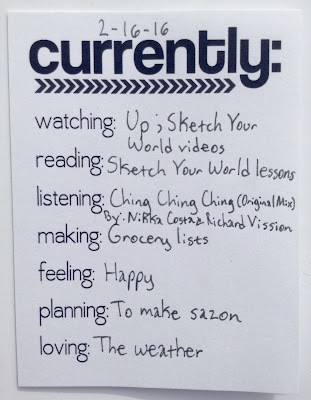 I'm finally starting to get caught up with Olya Schmidt's Sketch Your World class. I haven't started on the actual sketches and paintings, but I have watched all of the videos. Reading: Speaking of the Sketch Your World class, I have also read all of the lessons. I wrote down any supplies that I need to get and I also wrote down the assignments as well so I can finally get started on some sketches. Listening: I don't think I will ever get tired of hearing this song. Making: I finally made my grocery list and I love that most of the items on my list are healthy. Yay for lots of fruits. I see a lot of smoothies in my near future. Feeling: Today has been a really great day. Planning: In the next few days, I plan to go with my mami to the farmer's market so that I can get the ingredients she uses to make sazon. I looked online for a recipe and there were a bunch, but I figured that I should get exactly what my mami purchases to make her homemade sazon. Loving: Today's weather was perfect. It was not too cold or too hot. It's 60 degrees right now and it feels awesome! Happy Monday! 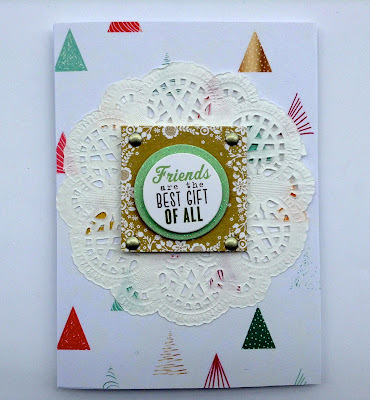 Today, I'm joining Krysten and Lindsay's weekly link up. 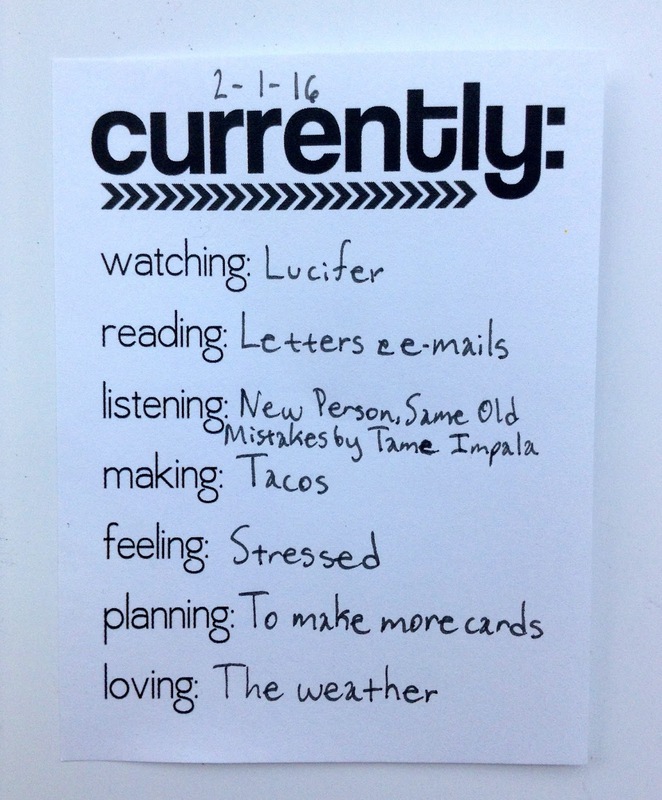 I meant to post this yesterday, but decided that today would be great to finish up my list. So instead of just including what made me happy during week, I also included what made me happy during the weekend as well. 2. Deadpool...This movie was awesome! 4. The Weeknd's "Acquainted". This song has been on repeat like all weekend. 5. Rihanna's Work. Another song that has been on repeat. Bonus: My hair. I went to the hair salon and got it straightened. I can't believe how long it is. Hello! Hello! On Tuesday, we had some pretty big snow flurries and even though it looked so pretty, I am just so over the winter weather. 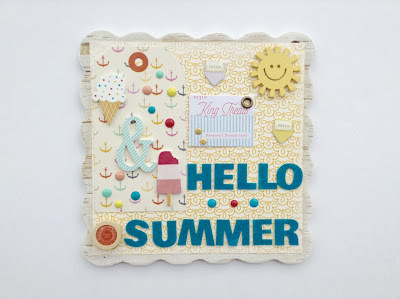 So I decided to make a summer themed home decor and just hope that warmer weather will soon be here. I was going to make a card, but decided that I wanted to try something different. Since I don't normally make a lot of home decor projects, I decided to make something that I can put on top of my desk or on my display case. I found a few wooden bases that had patterned paper already adhered to it so I decided to use one. Luckily, I knew what items I wanted to use so all I had to do was just arrange the items onto the base before adhering them. Once I knew where I wanted my items, I began to adhere the supplies. First, I adhered my tag, ice cream, sun and ampersand wood veneers. Then I added the enamel dots and the other small layered embellishments. I adhered the felt letters last. 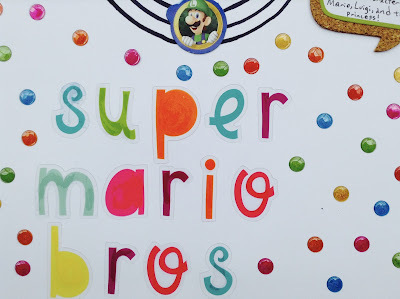 To adhere the felt letters, I used my Tombow Mono Liquid Glue and was careful not put too much on the letters. I love how this home decor turned out and am thinking about making one for Spring, Fall, and Winter. I might even make a second Summer home decor as well. Here's to hoping for some warmer weather. Hello! 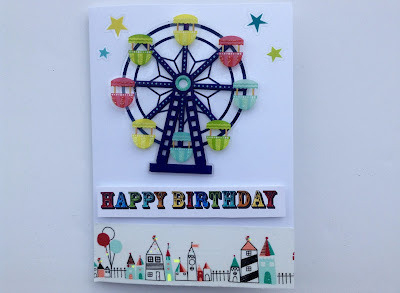 The circus is coming to town and since I love the circus and carnivals, I decided to make a carnival/circus themed birthday card. I used a white card base and then adhered the dimensional ferris wheel and the stars. Then I added the washi tape at the bottom. That washi tape is awesome and definitely one of my top favorite washi tapes. I used a cut out sentiment and used my Tim Holtz distress markers to color in the letters. I made sure to use colors that matched the washi tape and the stickers. 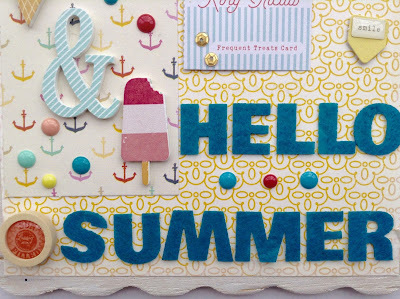 I love the bright colors on this card and I love the ready-stamped greeting. It was so convenient to have and I loved that I didn't have to worry about selecting embellishments to spell out the sentiment. Would you rather go to the circus or a carnival? Which one is your favorite? Watching: I really can't stand this cartoon, but the boys and John were watching it. There was nothing on tv so I decided to watch for a little bit as well. Reading: I just started reading this book and am only a few pages in, but I am already loving it. Listening: I'm obsessed with these two bands right now. I might have to buy their albums. Making: I've been making lots of blog posts and am scheduling them for the rest of this week. It's so convenient to be able to schedule my posts. Feeling: I have been feeling really tired even though I have been getting a decent amount of rest and sleep. I have no idea what is going on. Maybe it's just winter and this weather...I've just been feeling very "blah". Planning: I can't wait to work on this and definitely plan to make a post about it. Stay tuned! Loving: I have been living in my two favorite sweaters. They are so comfy and warm. Hello! Happy Monday! So I took a break from making Valentine's Day cards and made some more birthday cards. You can never have too many birthday cards. 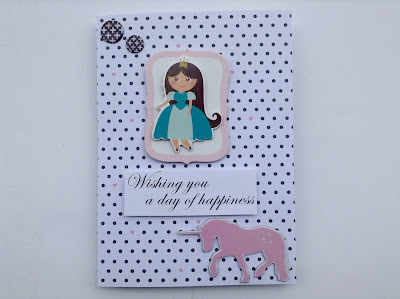 When I saw a bunch of princess themed embellishments in my stash, I knew that they would be perfect for birthday cards. I immediately thought of my niece because I call her Princess Gen. 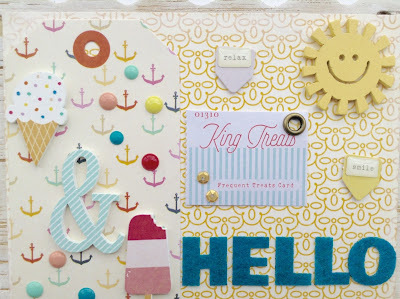 I used some papers from Crate Paper's Hello Love. I love that there are small pink hearts mixed in the polka dots. I used a sentiment that came in a few pack with a magazine that I purchased. 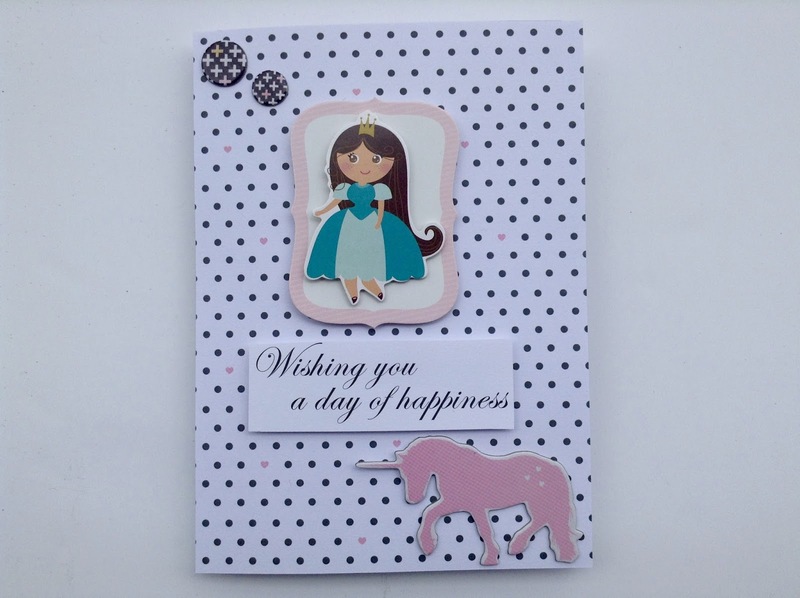 The circle embellishments and the unicorn came from a Pink Paisley Bella Rouge chipboard sticker pack. Unfortunately, I can't remember where the Princess embellishment came from. I can't wait to give my niece this card. I may even give it to her before it's her birthday. I think the sentiment could definitely work as an everyday, thinking of you, or just hoping you have a great day card rather than the obvious birthday card. Hello! I have been busy making a lot of cards these past few weeks. Most of the cards that I have been making are Valentine's Day cards, but I did manage to make a batch of non-Valentine's Day cards. 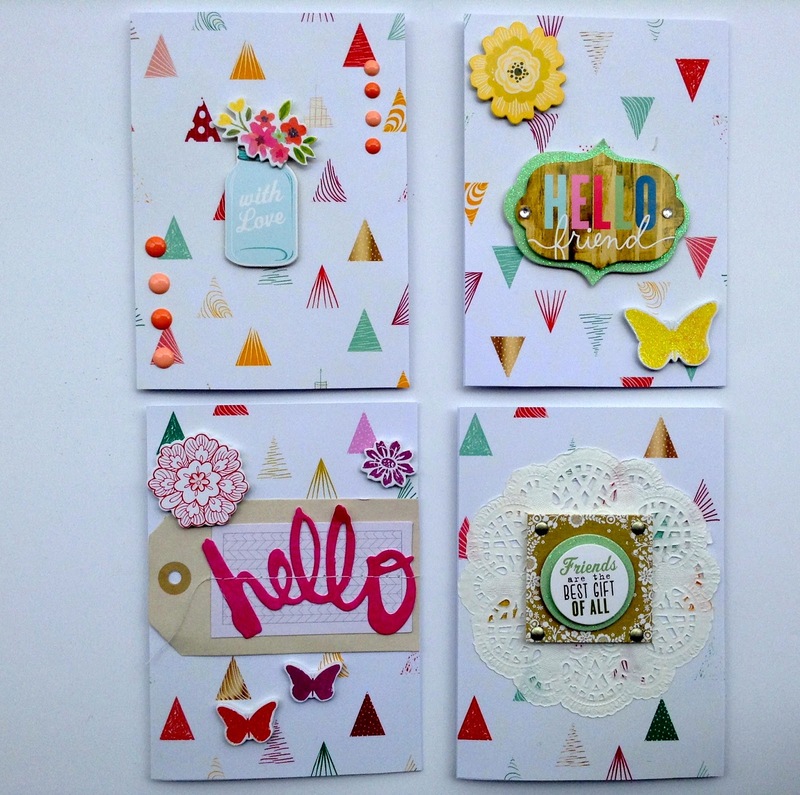 A few days ago, I made four cards using items from Dear Lizzy, American Crafts, and Me & My Big Ideas. 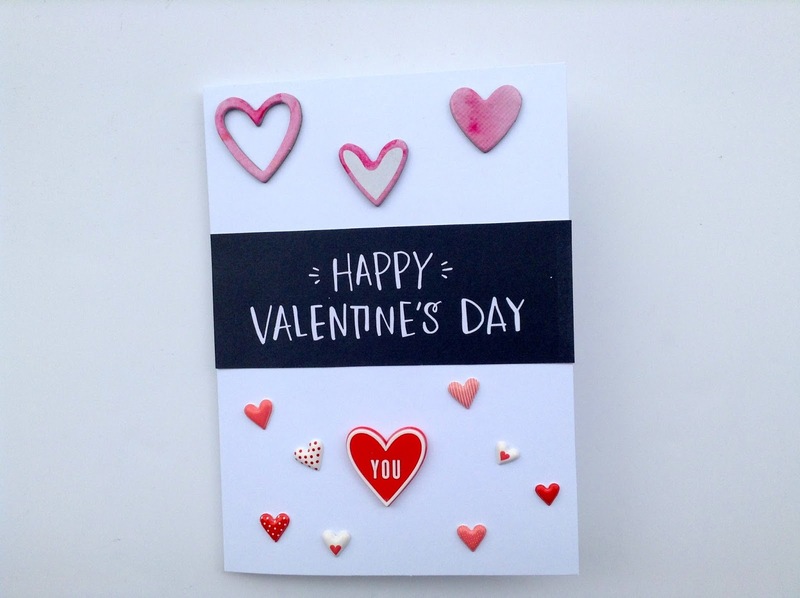 Most of the cards that I made can be sent to friends, but a couple could also be sent to family members as well. I think the "With Love" card is my favorite out of the bunch. I love the chipboard mason jar and flowers. I wanted to use the enamel dots in the same size, but ran out. So I decided to use smaller enamel dots on the top right side and some medium size enamel dots on the lower left side. 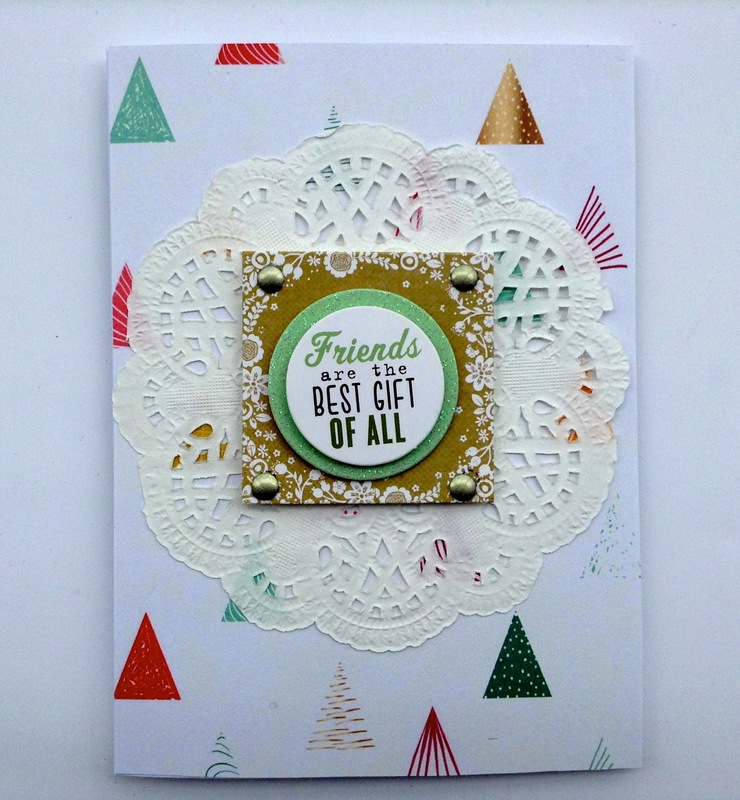 I was originally going to just stick the square embellishment onto the card, but worried that it would look too plain. I ended up asking my husband if he liked the card with or without the doily and he said he liked it with the doily. So I ended up adhering the doily onto the card. I really love the stitched tag on this card. One of these days, I'm going to try and stitch on my crafts, but for now I am loving the tags that I got in a mason jar from Tuesday Morning. I added some foam flowers and butterflies to complete the card. 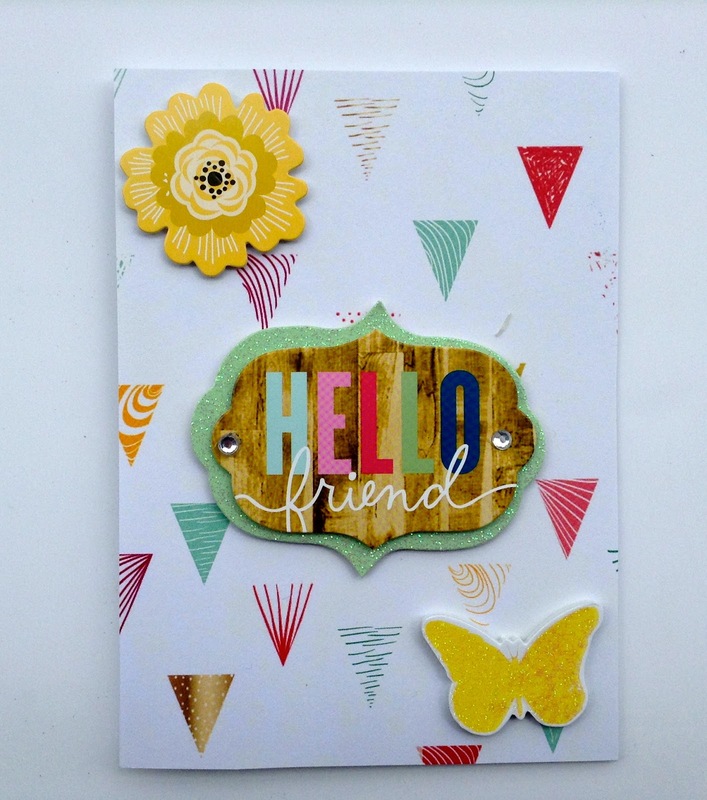 I used another foam butterfly on this card as well as some embellishments from a Me & My Big Ideas embellishment pack. 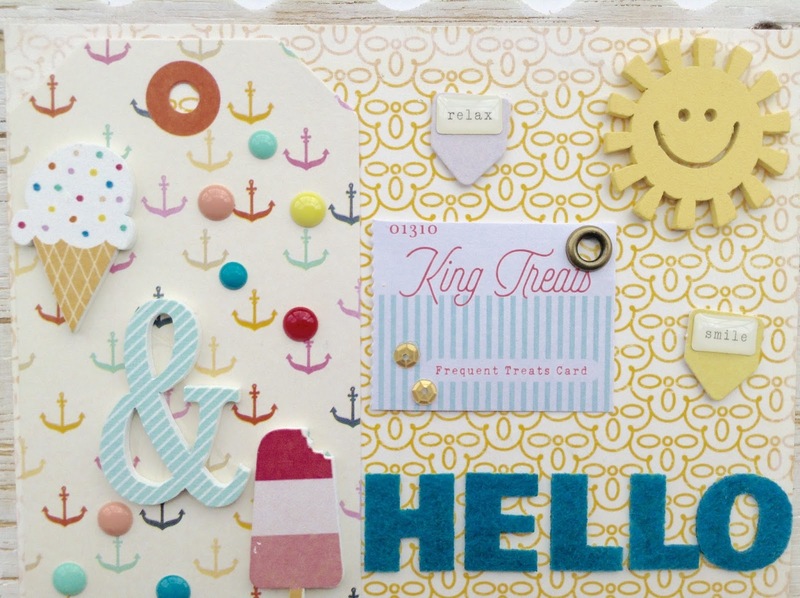 I really love the "Hello friend" layered embellishment. I can't wait to mail these cards off to a couple of friends and family. Hopefully, they will love it. Hello! 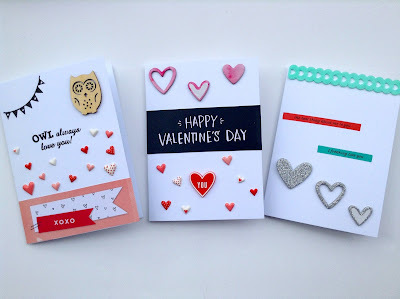 I have been sharing Valentine's Day cards that I have been making over the past few weeks. You can check my previous cards here, here, and here. Today, I want to share another batch of cards that I made. I made three cards a few days ago, using supplies that I have had for a long time. 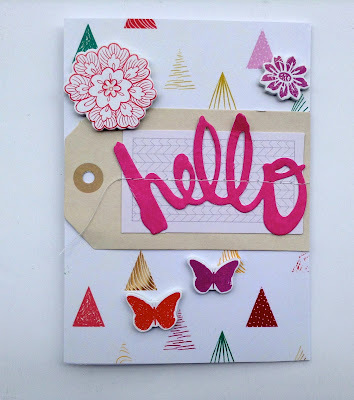 The only items that were new are the papers from Crate Paper's new line, Hello Love and my Recollections Valentine's Day stamp set. I really, really love this card. As soon as I saw that "Owl always love you!" 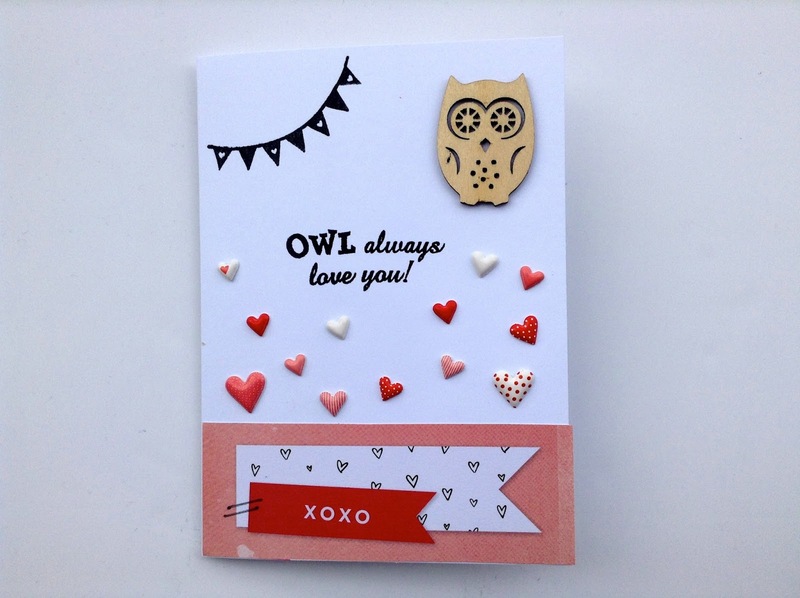 sentiment, I knew that I would have to add an owl. Luckily, I still have all of the owl wood veneers that I got in a previous Freckled Fawn kit. I also used some puffy stickers that I received in a RAK/Swap group that I am in. 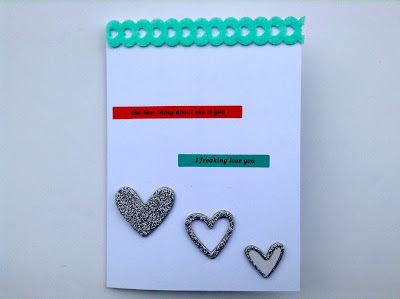 I decided to keep this card a bit simple and just add a few word strips and some glitter hearts. I also added a felt border strip at the top. I am still trying to get used to using felt in my projects. It's not my favorite item to work with, but I'm trying to challenge myself to make projects with items that I do not normally use. For my last card, I wanted to use pink, red, and black on my card. I ended up using some pink hearts at the top. I love that the colors look like watercolors. Then I added a "Happy Valentine's Day" sentiment in the middle of the card. At the bottom of the card, I used some more puffy stickers as well as a rubber sticker. Using rubber stickers is another item that I normally do not work with, but I'm very glad that I did. 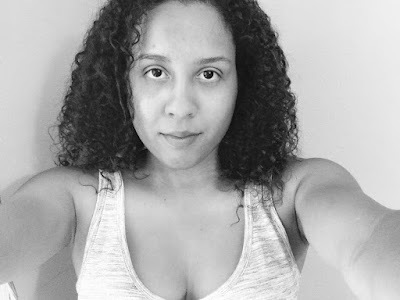 You may notice that I have been using my February 2015 Freckled Fawn a lot. I have been holding onto this kit because I love so many of the items, but I really need to start using them instead of just letting them sit on my desk. Are you making any Valentine's Day cards or projects? Watching: This show is going to be awesome even though we only watched the pilot episode. Reading: Surprisingly, I didn't read any blogs. I did read lots of letters and e-mails. I plan to start reading The Alchemist this week and finish reading Is Everybody Hanging Out Without Me soon. Listening: How did not know about this band? Thanks Rihanna for making a cover of their song...now I know who this band this and I'm loving their songs. Making: You can never go wrong with tacos for dinner. Yum! 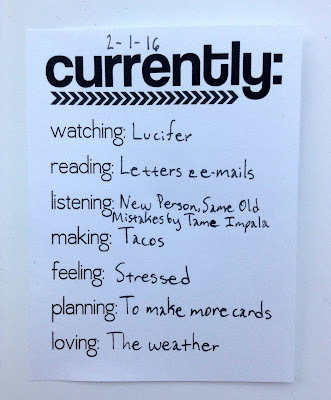 Planning: I need to make more cards and I may even try to make some watercolor cards too! Loving: The weather has been fantastic! Here's to hoping for an early Spring! Hey! Hey! Happy Monday! 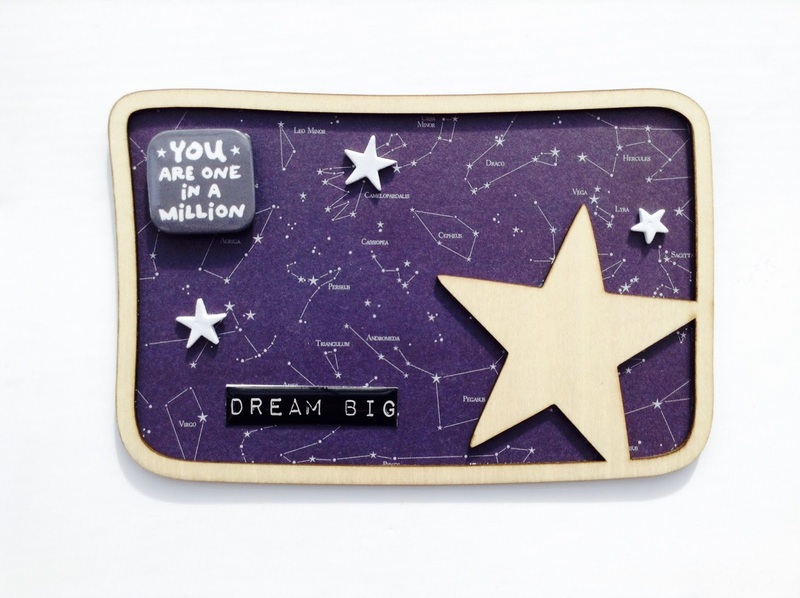 Today, I want to share a Project Life card that I made using a wood veneer and some September Skies paper designed by Heidi Swapp. Sorry in advance for the picture. I tried taking several pictures and it just was not coming out the way I wanted it to. I was a bit hesitant to use the wood veneer piece because I had no idea what I wanted to use it on. I'm used to using smaller wood veneers and not large ones. 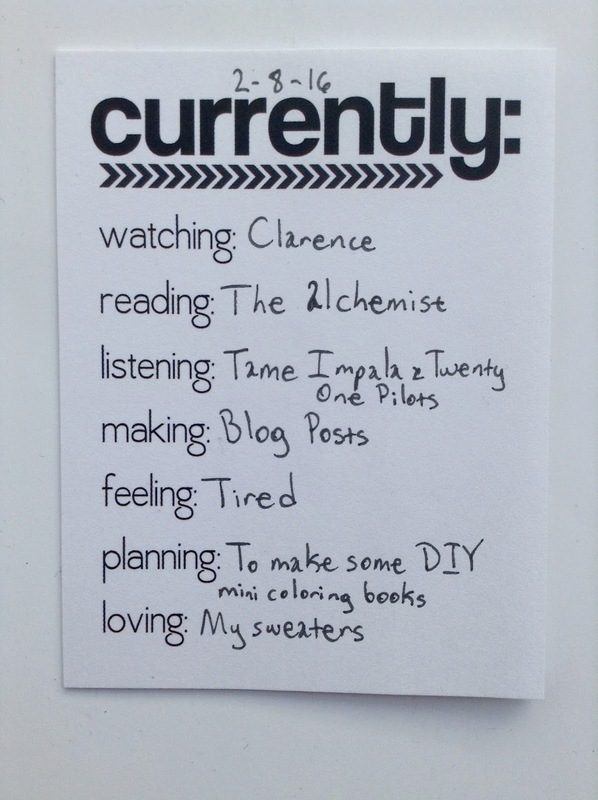 I was going to use it in a layout, but decided that it would be perfect as a project life card. 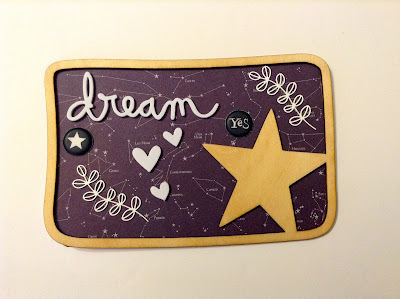 I also knew that I wanted to use the constellation paper from Heidi Swapp's September Skies paper pad. I adhered the wood veneer to the paper and then trimmed the excess paper. Then I added some small embellishments like the "dream" foam word and the heart foam pieces. Then I added some ferns and a few puffy stickers. Overall, I really love how the card came out. I'm glad that I decided to try something new and I definitely plan to do this more often.